One of our favorite things about spring is it’s prime asparagus season. We don’t hold back on incorporating this deliciously delicate veggie into as many dishes as possible, and this recipe is one of our favorite ways to enjoy it! We love the combination of salty cheese, earthy asparagus, and sweet and tart balsamic vinaigrette here, not to mention how cute it looks all sliced up! It makes a lovely addition to any springtime spread, particularly brunch (our favorite meal). When we want to wow our friends and family, we whip up this savory tart – they’re always amazed at how elegant it is, and we’re always amazed at how easy and delicious it is! Take both sheets of thawed puff pastry and place them on lined baking sheet, overlapping them by 1 inch and pressing the seam gently to seal. Place baking sheet in oven and bake for 12-15 minutes, or until golden brown and lightly puffed up. Remove from oven and let cool 2-3 minutes, then brush honey dijon mustard and balsamic vinegar onto the center of puff pastry. Evenly sprinkle assorted cheeses over the center of tart. 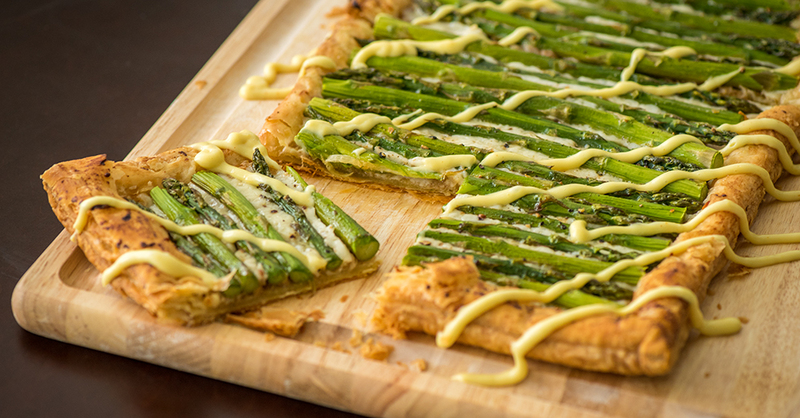 Take your asparagus and trim the ends so they fit into the center rectangle of tart. Lay asparagus out in a single layer, alternating the direction ot the tips with each row, then brush with olive oil and season generously with salt and pepper. Return baking sheet to oven and bake for 20-25 minutes, or until pastry is golden brown and edges are puffed up, and asparagus is tender. Remove from oven and let cool 5 minutes, then drizzle with hollandaise sauce, slice, serve and enjoy!